Formwork front-view fireplace. Polished Concrete frame. Model presented with EUROPA 7 EVOLUTION «BLACK LINE» firebox. Concrete is a rough material, which appearance could suffers significant shades. Formwork surrounding not offered. Remote-controlled automatic combustion block in a custom-made podium. Combustion block embedded in a custom-made stone podium. 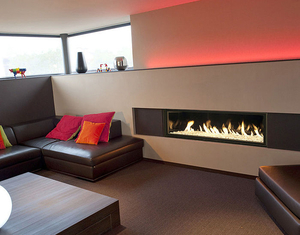 A built-in fireplace is often used for heating living spaces. Although many types may require a chimney for evacuation of fumes and ventilation, some can be used without attachment to a chimney or an external wall vent. These fireplaces are used as a focal point in domestic living spaces and some commercial environments, such as hotels and bars. There are both open and closed models. Such fireplaces may be fired by wood, biofuel, gas or electricity. While wood and similar fuels require a chimney to evacuate fumes and provide enough oxygen for proper combustion, electric and other models may not require exterior ventilation. These are often much easier to install and maintain. Ensure that the unit's size, style and type of fire are appropriate for the room in light of ventilation. Chimneys and flues must be carefully examined and repaired if necessary. Consider installation modalities, ease of use and maintenance. There should be no nearby flammable materials and flames should be easily doused. Gas units must be checked regularly, especially in public or commercial buildings. Consider fuel storage and the possible need for fire guards.